MIAMI, Okla. (AP) - An SUV carrying eight mushroom farm workers veered off a snowy highway bridge Thursday and launched itself off an angled, plowed snowdrift and over the guardrail before plummeting into a shallow icy river 61 feet below. Three died and the others suffered from hypothermia and trauma after their red Chevrolet Avalanche careened off the Interstate 44 bridge and into the Spring River. "That alone is a very dangerous type of crash. This is a very traumatic crash," Oklahoma Highway Patrol Lt. George Brown said. "The ground temperature was 11 degrees below zero, so it would take only a second to become hypothermic in this water and ice." Two of the victims, driver Leonor Alcano, 31, and front-seat passenger Irma Garcia, 37, died of hypothermia after being pinned in the SUV and the six others climbed atop the vehicle, a Highway Patrol report said. One of the initial survivors, Douglas Monzon, 22, fell into the water while reaching for a rope dangled by would-be rescuers and died later at a hospital after failing to climb back onto the truck. All the victims were from Carthage, Mo., and worked at a mushroom farm near Miami, Okla. They had nearly completed their 40-mile commute when the accident occurred at 6:24 a.m. The road had been impassable less than nine hours earlier after a blizzard that barreled through Oklahoma on Tuesday dumped more than 20 inches of snow, sleet and ice. The police report said Alcano, driving westbound, lost control on the ice-covered road, hit a concrete wall, slid broadside and overturned before going over the bridge wall and falling 61 feet into water that was 4 feet deep. Ottawa County Sheriff Terry Durborow said the truck's driver simply "went airborne." "I don't know if (he) lost control of her vehicle or not. (He) just jumped the guard rail off that bridge," Durborow said. "It's probably the worst conditions I've seen, and I've lived here all my life," Durborow said. The eight worked at Engelbrecht Farms. Scott Engelbrecht, who runs the mushroom farm, said the operation was shuttered Wednesday because of the weather and reopened Thursday. The 45 or so workers heard the news about their colleagues shortly after 9 a.m., he said. "It's a devastating event and it's tough to know how to deal with it," Engelbrecht said. Interstate 44 - also known as the Will Rogers Turnpike - was shut down Tuesday and much of Wednesday because of a blizzard that stretched from the Southwest to New England. Even with the roads opened, highway officials urged caution as temperatures at 10 below and colder kept them frozen. "If people look at the conditions they're driving in, slow down and pay attention and realize they're driving in very hazardous conditions, they're going to make it," said Jack Damrill, a spokesman for the Oklahoma Turnpike Authority in Oklahoma City. The plowed snow banks on the bridge formed an almost perfect 45-degree angle. However, Damrill downplayed any suggestion that the road should not have been reopened. "Yes, there's snow on the sides," he said. "We clear lanes of travel first. There's nowhere for that snow to go. We push everything to the side first to get the lanes open." Oklahoma began preparing for the snowstorm last week by stockpiling solvents and salts to treat roads, but the size of the blizzard seemed to overwhelm the response. For a time Tuesday and Wednesday, the National Guard and state troopers had to pluck stranded motorists from roadways. "First, it's only 6 degrees up there with no sunshine. It snowed 20-something inches up there," Damrill said. "This is very unusual to have these kinds of blizzard conditions. Our material doesn't work when it's that cold." Television footage showed the large vehicle resting upright and partially submerged in the Spring River. While the water there was only waist-deep, Brown said hypothermia would have quickly set in. Motorists who witnessed the accident said they peered over the side of the bridge and spotted the six people outside the truck in the icy water and two others inside the vehicle, Brown said. "The rescue teams got a small boat, hoisted it down in the water and started the recovery," Brown said. Grady Weston, the assistant chief of the Newton County (Mo.) 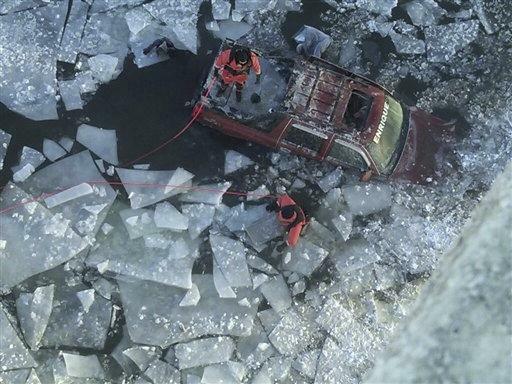 Rescue and Recovery squad, said the SUV had broken through ice and was half-submerged when his crews arrived. "Three of us waded out into the river . . . and helped get the last three or four out," Weston said. Three survivors were at the St. John's Regional Medical Center in Joplin, according to David Morris, the hospital's director of marketing. The Freeman Health Center at Joplin received also received three people, including Monzon. The Highway Patrol said all the survivors - four men and a woman - were in critical condition with hypothermia, and that all but the woman suffered trauma to their arms and legs. Murphy reported from Oklahoma City. Associated Press writer Justin Juozapavicius in Tulsa contributed to this report.